Stampin' Up! 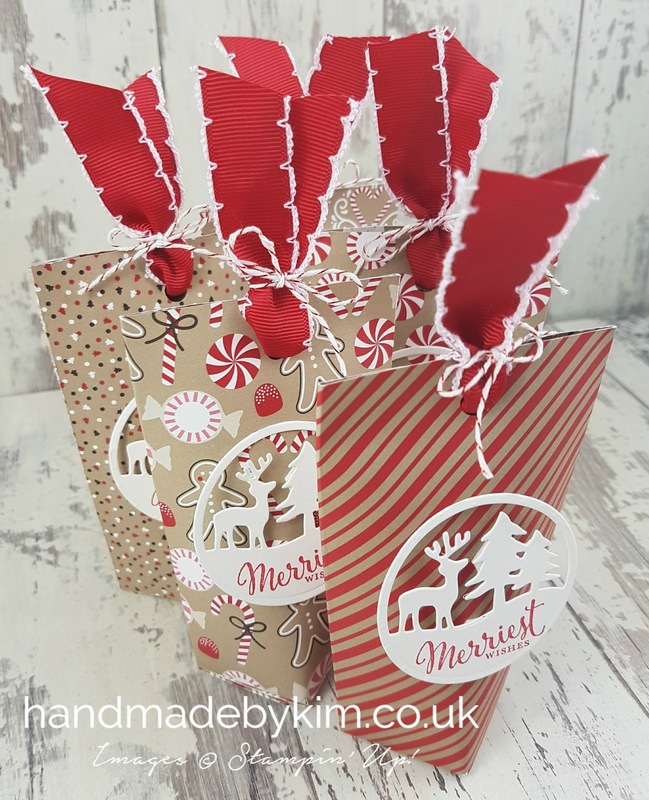 Demonstrator Kim Price - Handmade by Kim: Christmas Treat Bags using 6" x 6" Candy Cane Lane Designer Series Paper by Stampin' Up! Time has gone by so quickly and unfortunately I never got a chance to make any handmade Christmas cards this year. It's such as shame as I had so much lovely product to use. Thankfully I managed to quickly whip up 21 of these ever so cute gift bags for my team and my colleagues at work. They are really quick to cut and build - but they take a little longer to embellish. They contain a few chocolate Celebrations. We've already gone through quite a few boxes of Celebrations and other treats in the office so these gifts were more a token of my appreciation for all the team's hard work this year. I hope they liked receiving them! 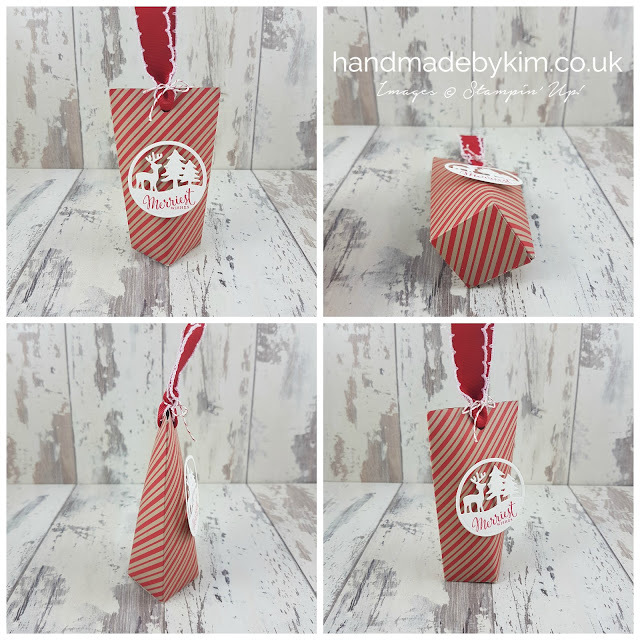 I'm actually quite proud of these little treat bags, they are my first original design!! Its more than likely someone, somewhere in the world would have also made this shape bag but I certainly haven't seen them before. The collage below shows the shape of the bag a little better. It's super simple to make and if anyone is interested, please make sure you leave a comment asking me to publish the instructions. If I get a good response, it might just tempt me to do my first YouTube video. On 31st December 2015 I set myself to reach 100,000 page hits. I like working to targets and achieving/exceeding them. Whilst I cannot be a "business" demo who teaches classes and runs workshops etc, I wanted to challenge myself in another way. I really enjoy blogging and thought this would be fun to aim for. On 31st December 2015 I had reached 37,000 page hits and that had taken a year and a half from when I started my blog in July 2014. So naturally reaching 100,000 page hits for me in particular was a real challenge, especially considering I don't do YouTube videos. With my broadband out of action for a month, I was really worried I wasn't going to reach my target. I'll share the number of page hits I've reached on 31st December 2016, in between now and then I would love you to have a browse through my blog at the projects I have made. There is a cool menu on the left hand that has grouped together handmade projects of particular categories, I would also be so happy if you took the time ti have a look at some of my older projects and leave a little comment (or question) here and there. Finally, I'd like to take this opportunity to wish you and your families a wonderful Christmas and New Year. I would also like to say thank you to all my followers and subscribers across all channels for following and supporting me for the past two and a half years. I am so pleased you found something, either on my blog or my social media pages - that you liked enough for you to subscribe or follow me - thank you! p.s my broadband is only just up and running again so hopefully I'll be back to blogging regularly again the the New Year. Currently I have a speed of 3.5 mb, so wish me luck! Love, love, love this bag. Oh you must do a video for this, you cleaver lady. Would at least love you to publish some instructions please. Many thanks for sharing. Take care. Would love to see a video. These bags are really cute. Very cute. Would love to see how you made these. Love the bags. TFS. Would love instructions please. I love this bag! If you could post instructions on how to create this, that would be awesome! Thank you! Hi Chris, I will certainly do this, thanks for visiting my blog! Very cute bag! I too would love to see a tutorial! TFS!! Along with everyone else, please make a tutorial. You should be proud of your first original creation. Oh please make a tutorial for us who dream of being as creative as you. The tag is also a winner!!! LOVE IT!!! You are so clever to have created this! Count me in as someone who would love your tutorial! A photo and text or video tutorial would be great! I'd love to see how you made them as they are so cute! very cute! Would definitely like to see/read some instruction on how to make the treat bags. Definitely want to see a video about making these bags! Hopefully in the next few weeks Jenny! Please please do instructions! 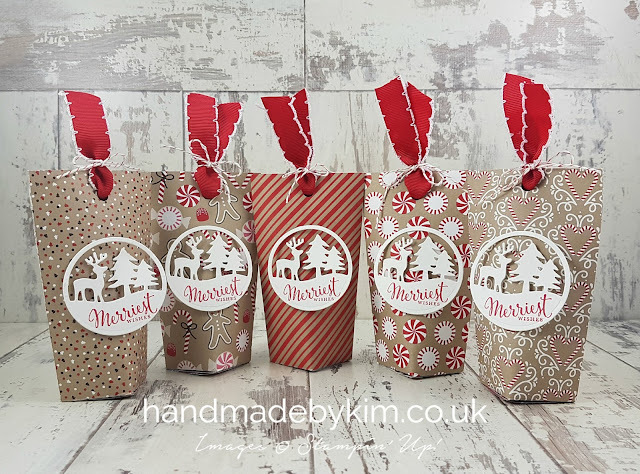 I have a pack of this paper to use and could get these ready for my office for next Christmas!! Please show us how to make these! They will work for Valentines treat, birthday - so many occasions. You just took the words out of my mouth! I've already made some with some new DSP but just trying to decide what look to go for in my video. I am thinking polka dots may be quite cute. I would love to see instructions how to make these!! Too cute! Thanks Gail, I'm working on it!